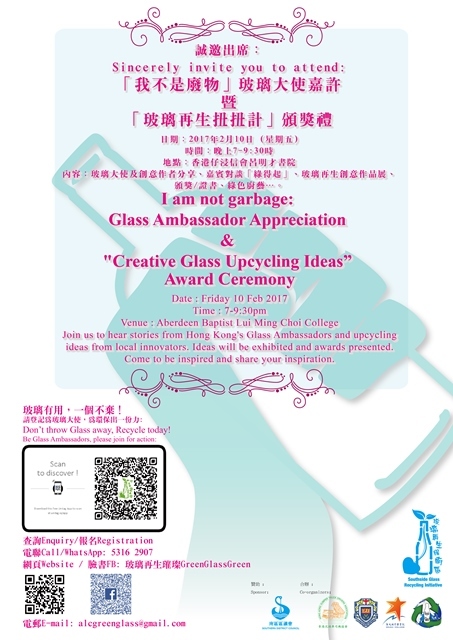 Join us to hear stories from Hong Kong's Glass Ambassadors and upcycling ideas from local innovators. Ideas will be exhibited and awards presented. Come to be inspired and share your inspiration. Don't throw Glass away, Recycle today! This entry was posted in English, News and Events, Uncategorized, 新鮮熱報, 最新消息. Bookmark the permalink.